Most people think of a hospital as a place for patients to be treated in order to improve their physical condition and well-being. A hospital is often thought of as a place for recovery and healing. Unfortunately, patients are sometimes neglected or forgotten by hospital staff- including doctors, nurses, therapists and other hospital personnel. For a country that is so technically advanced and well-educated, hospital negligence still happens much too often. If you feel as though you have been a victim of hospital negligence or medical malpractice, you should contact the Maryland medical malpractice lawyers of Foran & Foran, P.A. to speak with an attorney. There are instances when a hospital does not have enough people working which leads to the staff attempting to take care of too many patients. Furthermore, this may cause the staff to make mistakes with patients because they have too many responsibilities and patients to take care of. Ultimately, by neglecting to properly treat patients for initial problems they may have, serious infections and illnesses can possibly get worse, and therefore, a misdiagnosis can occur. For instance, a nurse or doctor might administer the wrong medication or dose, or forget to administer the medication completely, which can cause serious consequences for a sick patient or a patient recovering from surgery. Pharmaceutical errors can cause major complications and put a patient’s life in danger. Sometimes, doctors misdiagnose strokes, heart attacks or other types of internal injuries which can obviously cause serious problems for patients. Also, doctors might completely fail to diagnose a disease such as cervical, breast, or ovarian cancer in women and prostate or testicular cancer in men. Two other common cancers that can be sometimes overlooked are skin cancer and colorectal cancer. A doctor might ignore initial symptoms a patient presents with, or the doctor could fail to order routine laboratory tests. Finally, some women face risks when delivering a baby because of mistakes a doctor might make in the delivery room. Serious life-threatening consequences can occur for babies such as physical birth injuries, cerebral palsy, and brain injuries if the doctor fails to properly deliver a baby or if the anesthetic is inappropriately administered. Another problem for patients is when the doctor or doctor’s office fails to have the patient sign a “consent form.” Before performing any surgery, treatment, or procedure, the doctor is obligated to give information about the service in order for the patient to decide if they wish to continue with the treatment. The patient should sign a “consent form” if they agree to the plan that the doctor has recommended. The “consent form” should explain the alternate choices for the actual procedure, the risks and benefits, as well as the results and side effects that the doctor expects to see. In most instances, the doctor should recommend a safer alternative to the surgical procedure in case the patient does not feel comfortable in going through with it. The whole point of “informed consent” is so that the patient, has the right to make an educated decision about the steps one can take for safety and health. Although the doctor will do everything they can to treat the patient to the best of their ability to improve the patient’s health, it is ultimately the patient’s choice to proceed with any surgeries, treatments, or procedures. Additionally, patients should make sure that their physician follows through with the plan that was agreed upon. For example, some doctors and patients agree to a specific type of surgery, and then the doctor changes it at the last minute because he or she felt it was the best option. Since patient did not agree to this change of treatment, the patient might have unwanted results or problems that the patient did not expect to have when making the initial decision. Overall, it is important to make sure the doctor informs you before any procedure and that both doctor and patient agree to the proposed treatment. Consider another doctor who might give different treatment options if the treating doctor is adamant about a procedure which the patient may not agree to. If the doctor fails to inform the patient before a surgery or other type of treatment, and the results and/or side effects are not what was expected, then there may be negligence on the part of the hospital /and/or treating doctor. In addition, because there are so many medications for a doctor to choose from when treating patients, there is additional room for error. Over the past few decades, there have been so many medications that have been introduced into the world and doctors do not always make the right choice in prescribing the correct medicine for the particular sickness or disease. There are so many important things a doctor must consider when prescribing a medicine; such as possible side effects, allergies, drug interactions (patients are currently on other prescribed or over-the-counter medicines), and dosing. Even in surgeries, anesthesiologists have the potential to inappropriately administer an anesthetic for pain which can cause very serious problems and side effects due to the sensitivity of the area where he/she make the injection (spinal cord). Furthermore, if a doctor is performing surgery in an area near the spinal cord, patients should be informed about the risks involved before they go through with the surgery. 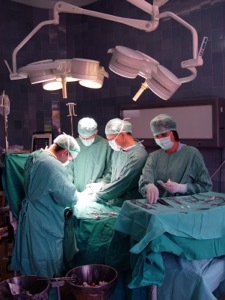 (The main risk in these types of surgeries is paralysis because it is near the spinal cord.) However, there are instances when a surgeon makes a mistake which leads to very serious consequences for a patient. The surgeon might make a surgical mistake during the actual surgery or misuse a medical device. Also, the surgeon might perform a surgery that is outside the scope of his experience or training. A doctor’s wrong decision can lead not only to a medicine being ineffective which makes the patient even more sick, but more serious conditions like brain damage, liver poisoning, paralysis, coma, and even death. Another serious condition to consider is when a person suffers a heart attack. Heart disease is so prevalent in the United States and it kills thousands of people each year. When a patient suffers from a heart attack, medical professionals need to act very fast. Sometimes, when a patient is brought into the Emergency Room presenting with classic symptoms of a heart attack, the doctor might fail to properly diagnose and treat the patient for a heart attack and mistakes it for a less serious condition. Doctors sometimes ignore the initial symptoms or complaints of the patient, and furthermore they fail to order the appropriate laboratory tests to make sure the patient is stable. This can cause serious consequences for patients, including the most serious- death. If you feel as though you or a loved one suffered a heart attack and had major complications because a doctor failed to diagnose the heart attack in the appropriate amount of time or failed to diagnose it at all, then you should consider talking to one of the Maryland medical malpractice lawyers and Foran & Foran, P.A.. Although a hospital is a place of healing, patients have the potential to contract an infection in the hospital, which is known as a hospital-acquired infection or “nosocomial infection.” Viral, bacterial, and fungal strains of germs are always present in any hospital. Germs can be passed to from patient to patient through the hands of medical personnel, and germs can simply be present because of hospital beds being so close together. Unfortunately, because there are so many sick people in the hospital, the infections that are present can be very serious and life-threatening. Patients that are already sick when they enter the hospital may have a weak immune system because of the fragile state of their body on entering the hospital. This is especially true for older patients because their immune systems are weaker than that of an average younger man or woman. Certain types of infections that an individual might contract in a hospital include but are not limited to: surgical infections, respiratory infections like pneumonia, blood infections, urinary tract infections, gastrointestinal infections, skin infections, and ear, nose and throat infections. If you feel as though you or a loved one contracted a serious infection from being a patient in a hospital, then you should consider talking to one of the Maryland medical malpractice lawyers at Foran & Foran, P.A. Overall, although everyone makes mistakes at some point in their lives, there is no excuse for a medical professional to make a serious mistake that could ultimately put a patient’s life in danger. Hospital negligence and medical malpractice happens too often, and medical professionals need to be held accountable for the mistakes that they make when treating patients. If you feel as though you or a loved one has been a victim of hospital negligence or medical malpractice, then you should contact the Maryland medical malpractice lawyers at Foran & Foran, P.A. today to speak with an attorney.